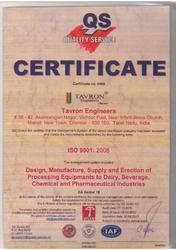 Tavron is a reputed name in the industry and a specialist in designing and supplying of equipment that are widely used in chemical, food and beverage and dairy industries. Our product range includes plate heat exchangers, spray dryers, beverage equipment, refrigeration equipment, stainless steel centrifugal pump, dairy equipment etc. Under the tutelage and leadership of our founder member we have carved a niche in this domain and are also trustable in the industry. We use our knowledge along with technical skills in order to produce fasteners that provide us a competitive edge over the others. Our company's success can be attributed to the enormous dedication and toil of our founder member as well as allied workforce in order to develop new products with latest technology which is in sync with the growing trends and demands of the ever changing industry. We design, develop, fabricate and erect these components and equipment using composite materials, considering varied parameters so that they can withstand the international quality standard. We strongly believe that the foundation and success of any business is to ultimately satisfy the consumer and we promote this with our products, which are highly reliable and superior in quality. We are a quality controlled organization and strive to maintain quality by all means. In order to maintain the standards of our quality we have set out certain quality guidelines which are strictly followed within the organization to manufacture defect free products. We use superior grade of raw materials for manufacturing our products. All our raw materials are procured from reliable vendors, who share a good market reputation. We have appointed a team of QC analysts to check the quality of raw material and the processes involved throughout the manufacturing unit. Right from the procurement of raw materials to the final production stage each and every product is inspected and in detail regarding the features the quality attributes so that they are completely flawless. As a manufacturer and exporter of wide range of industrial gears for different industries our products are made in desired dimensions. All our products are made using durable quality materials and are also demanded in the global markets. With special features like durability, strength, stress and corrosion resistance, our products are safe and easy to operate and are also cost effective. Manufactured using specialized techniques and mechanization, they are widely used in various industries. We strive to provide our clients with high caliber products at industry leading prices. Our dedication to progress is inherent in the service, we provide to our customers. We also seek to understand and identify future client needs and provide premium quality products that satisfy them. We with our services have earned numerous accolades both in the domestic and international markets. We have formed a team of highly efficient, dedicated and dynamic professionals, who have wide knowledge regarding the industry. Due to their penchant for excellence and innovative ideas, we have successfully made our presence in the highly competitive global market. Our team assists and coordinates in the entire production process so that the most desired product can be manufactured and provided to the clients. We also provide incentives, appraisals and awards to our employees in order to boost up their morale and create a feeling of responsibility and dedication. Our team can also adapt themselves to changes and take up new challenges in order to create outstanding products with high performance.